As a lifestyle website we love lights! But there's something mystical about those that colour-change like some of the lighting products we've reviewed in the past, such as when the traditional lightbulb met an iPhone App as a controller, that being the BlueBulb Bluetooth lightbulb. And another is the mobile lighting solution KICK Light from Rift Labs with over 40 individual LED modules. 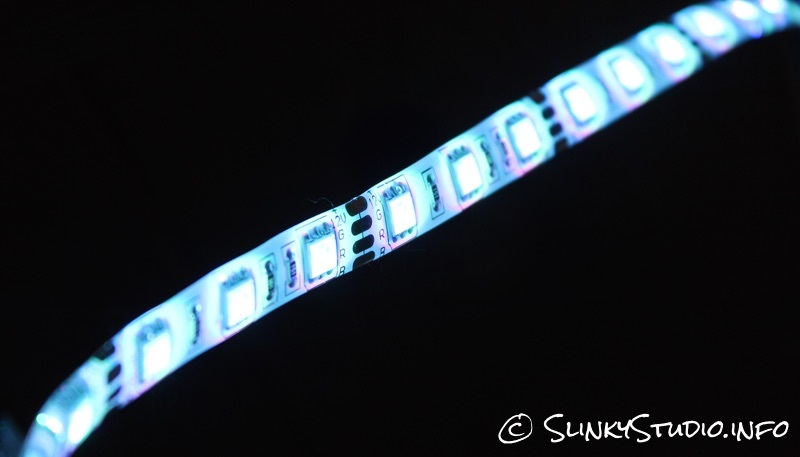 This latest offering is the BlueBulb Chameleon LED strip; we have the ten metre version but bigger lengths are available. At this length it's a lighting product that compliments existing lighting rather than being the sole lighting solution for the room it's in. We've been using the Chameleon in one of the rooms here at our studio that has white walls, which gives us a brilliant canvas to demonstrate the raw colours the BlueBulb Chameleon can reach. Because the strip is so thin and can easily be stuck onto most surfaces, it allows us to hide it underneath furniture such as wooden beds and desks, which creates a beautifully effective accent lighting. However, when the light is emitted up our walls it is quite phenomenal: the gradient of the brightness delivers soft illumination that becomes a changeable decoration in any room based on your mood, ideal for the home and office, but also brilliant for establishments like restaurants. There is a colour palette that should please anyone, with a claimed 16 million+ colours. The colours are proudly pronounced, vibrant and bright and it's the most energetic lighting product we've ever used, but one of the most unconventional too. Remember you'd need a few strips of these to light an entire room solely from them, which would be costly as an early adopter at the present time of writing. Regardless of this, in evening settings, when we're off to bed, the 10 metre strip works as an adequate sole lighting solution. And yes, it does have a bright white onboard too. 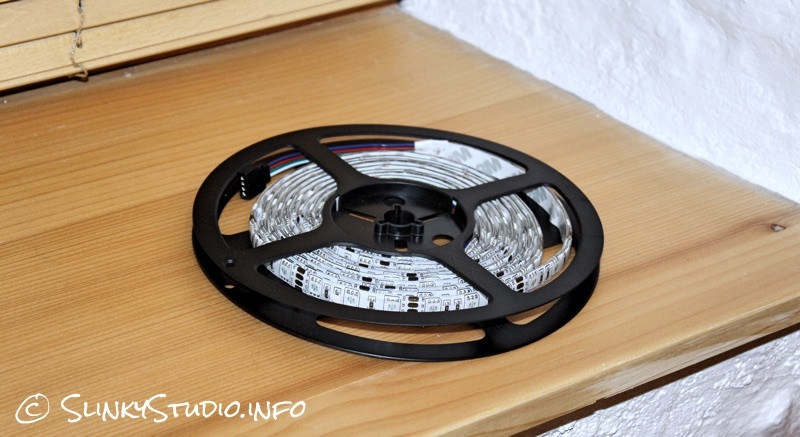 Traditional LED strip lighting products have tended to be one row of static coloured LEDs or have just changed colour from one coloured LED to another in patterns. We see no reason why BlueBulb haven't been able to enable this clever product to also display colour changing sequences, but maybe this will come in a future App update? An easy to use iOS App controls the Chameleon. Connecting to the Chameleon is snappy and doesn't require any additional setup after the first time the Bluetooth connection is established within the App, and interestingly setup is not done via the system settings. What we love the most about this seamless functionality is how it has been implemented to allow the adjustment of colour in real time with absolutely no delay, and up to eight Chameleon strips can all be controlled at the same time, too. We can slide our finger over a colour palette, which also includes the ability to alter the brightness, and see the LED strip harmoniously transform to the colour we desire - it's magical. The App also has the ability to set a timer and to make the colours transition. The strips can be cut to any length, which we didn't do, and they have connectors on either end, allowing further strips to be daisy chained at one end whilst the other fits into the control box which plugs into the 12 volt power supply. The strips have an adhesive sticky surface on the back of them protected by tape so the stick doesn't get interfered with before you want to use it. The stickiness is very strong, and although you could move the lighting around with some trouble, as we've found for the purpose of our review, we feel it's ideally suited to be installed and kept in one specific position. This is no trouble to do as the entire strip is highly flexible and the self adhesive backing stays reliably mounted, with no parts of it peeling away on surfaces such as wood and painted walls. In summary the BlueBulb Chameleon is a cool futuristic lighting product that helps enhance rooms and furniture by offering completely adjustable mood and accent lighting, the very principle of which could soon be the future theme of lighting within our homes as LEDs replace the conventional bulb.